According to designer Robert Perry, the Passport 37 is one of his favorite designs: It just looks right. This boat was reviewed in Cruising World magazine and featured in Latitudes and Attitudes magazine. The current owners have had her since October 2004. They are the second owners. The first owners took her through the Panama Canal, spending nearly 10 years cruising the coasts of Europe, including the Med. 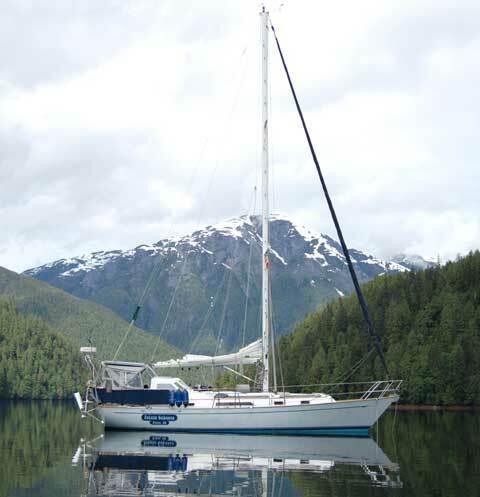 The current owners have cruised the waters of the Pacific Northwest for the last 4 years, putting over 5,000 new miles under her keel while exploring the coast of British Columbia. 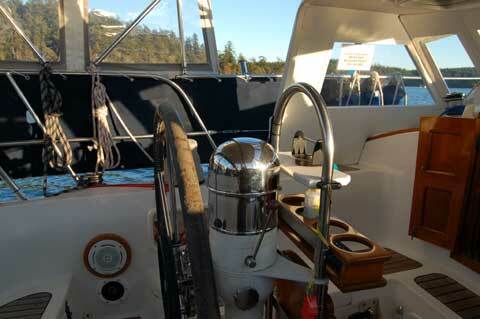 A recent surgery has made living aboard and cruising difficult for the current owners. With much soul searching and more than a little bit of regret, it is time to let her go to new owners that can use her as she was designed. 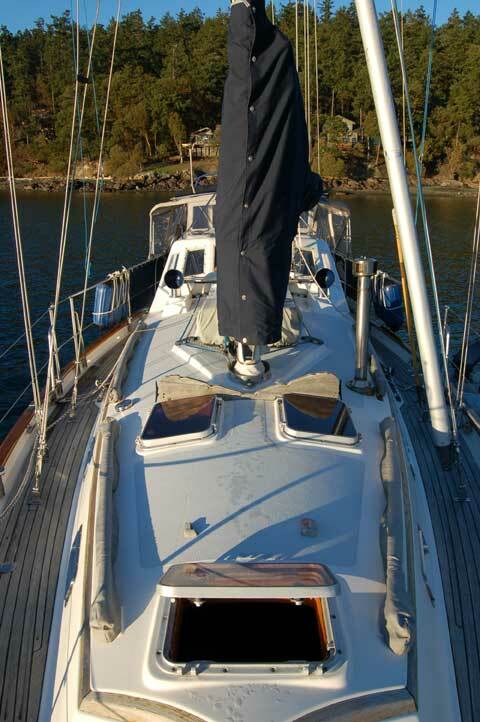 The Passport 37 is a ruggedly built, performance cruising sailboat. 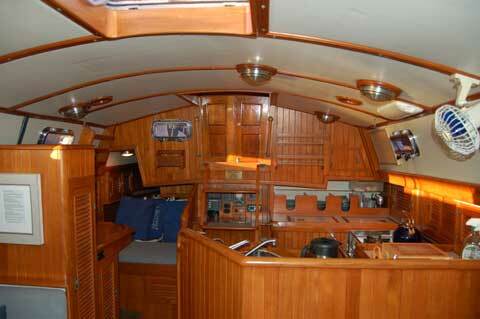 She is fast, stable and comfortable while underway and luxurious while living aboard at the dock. The current owners have refit nearly every on-board system over the last 4 years, including installing a new diesel engine, new batteries, a new Little Wonder watermaker, adding new solar panels, installing a Monitor windvane, and much, much more. She has been meticulously cared for, and all maintenance records and owner's manuals are available for review. If you are looking for a comfortable live-a-board sailboat that can take you anywhere on the planet in safety, comfort, and style, then look no further! This is the boat for you! She will sleep 5 in comfort and style. 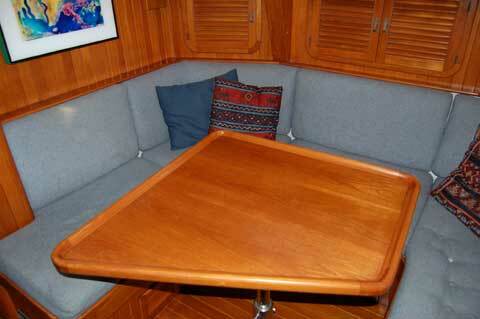 The contemporary solid teak interior is in beautiful condition. Teak & holly cabin sole are well cared for. All interior teak is stained with a light satin varnish. Coupled with the insulated white headliner accented with teak battens, you have a very bright and comfortable interior. Insulation between the liner and cabin roof is ~4” thick pink residential insulation. 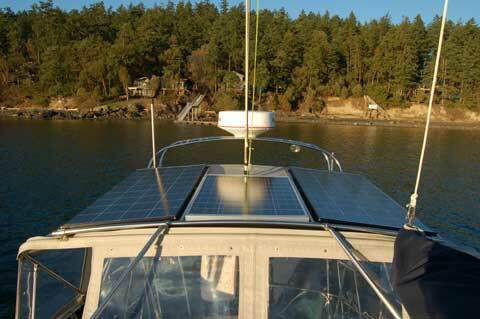 This keeps the boat very dry, even when living aboard in Pacific Northwest winters. Beginning forward, this boat features a v-berth with a custom, Tempur-pedic style mattress (new 2007). The mattress sits on top of a series of baffles to encourage air flow. There are 3 opening hatches in the v-berth, a book shelf, 3 additional storage shelves with louvered access doors, copious additional storage under the bed & an LED reading light (new 2006). Aft of the bed there is a series of shelves for clothes storage and a hanging locker. Next aft on the starboard side is the full size head featuring a completely separate shower stall (a must for living aboard and extensive cruising away from marinas), a Raritan PH-II marine head (rebuilt 2009), teak trimmed medicine cabinet, and additional storage under the sink and outboard of the toilet. Across from the head on the port side is a very large wardrobe (teak with louvered door), with a Dickenson, Antarctic diesel cabin heater immediately aft. Straight settee follows on the port side, with a C-shaped settee across. All the seating is deep and comfortable, and the table is teak. The table drops down to form a comfortable double bed. 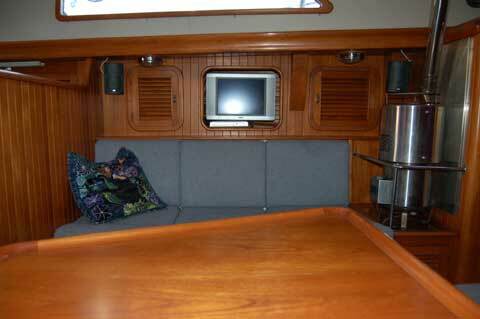 Aft of the settee is another hanging locker and a proper, forward facing navigation station. Across from the nav-station is the exceptional galley. Aft of the navigation station is the quarter berth. 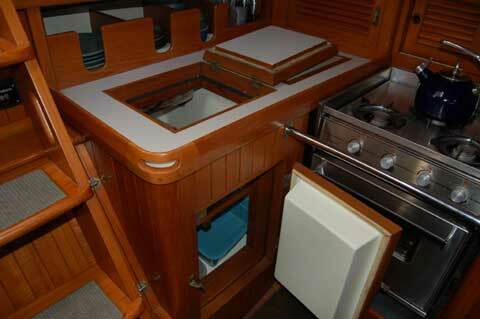 The galley is U-shaped and very secure with a very deep, double basin, stainless steel sink located on the center line. 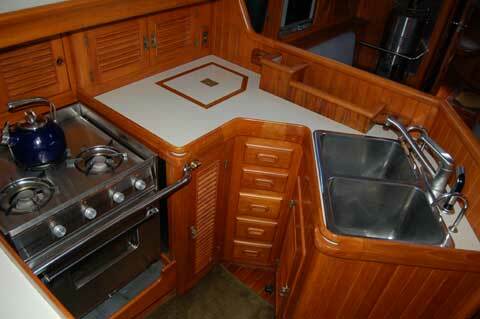 The counters are large enough to comfortably prepare gourmet meals and feature teak trimmed fiddles. Bob Perry is known for creating beautiful, functional galleys on the boats he designs. This galley is one of his finest, large and comfortable. Amazing for a 37' sailboat! Isotherm holding plate refrigeration with power conserving brain that allows the compressor to run at different settings depending on the voltage available in the batteries. Fridge is accessible from top or side. Both the fridge and freezer use freshwater from the port water tank to dissipate heat from the compressors, instead of salt water. 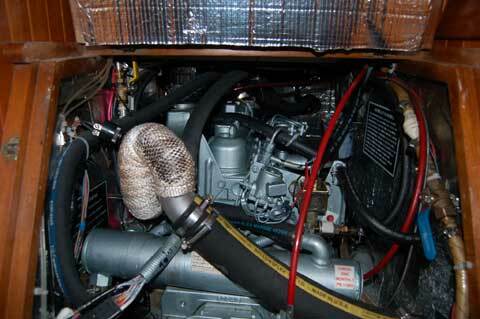 This eliminates the need for corrosion control on these systems and also means fewer holes in the hull. The boat comes with custom pottery plates, bowls & coffee cups. These were designed and created by the first owners, who are potters by trade. Interior speakers are by psb speakers (new 2005) and are spectacular!!! Toshiba, 14" LCD television with built-in DVD player (new 2005). Audio for TV is wired to play through the stereo and psb speakers for enhanced movie sound. TV is mounted on articulating arm. 660AH Trojan T-105 batteries (new 2006). These are secured with active tie-downs and secondary containment with lids. Universal M-40B diesel power plant with control panel (new 2005; all installation records and maintenance records are available). Engine is self bleeding. Seaward 6-gallon hot water heater (new 2006) with engine cooling system plumbed through hot water heater for access to hot water while motoring. The painting that shows up in the photos is not for sale with the boat. Our Passort 37 sailboat passed survey and sold yesterday. Thanks for your help. I did get several inquiries from your site. Keep up the good work!! !